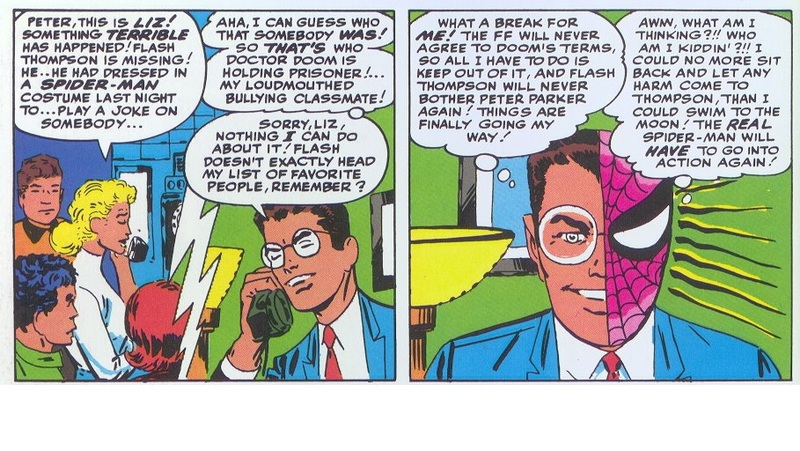 Possibly My Favorite Spider-Man Panel | What Would Spidey Do? That panel on the right may just be my favorite from the Spider-Man comics. When a friend showed me his collection of silver age comics, that was the one I wanted to see in the original version. It’s from Amazing Spider-Man #5, one of the character’s first ten appearances, even counting guest starr appearances in a Fantastic Four Annual #1 back-up story, and the Strange Tales Annual #2 team-up with the Human Torch. It gets to what makes the character so unique. He has moments of incredible pettiness and selfishness, even if he gets past it pretty quickly. He’ll risk his life to save a guy who doesn’t like him, but not without considering how his life would be better if that guy were to get killed off by the world’s most dangerous supervillain. This entry was posted in Spider-Man and tagged Lee/ Ditko, Stan Lee. Bookmark the permalink.